We offer FDA Certificates of Conformity with FDA grade products. 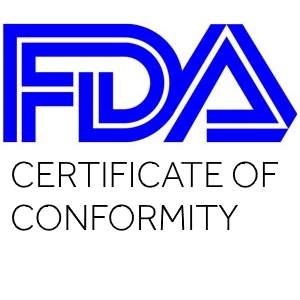 Please order your FDA products and add the FDA certificate of conformity to your cart. Please note FDA does not ‘approve’ products to CFR 21.177.2600. The manufacturer has the responsibility to prove compliance by publishing an FDA Certificate. A component may be produced using an FDA rubber material that is adequate for food contact; this does not imply that the part is technically suitable for its planned application.